Thank you to all my Ancestor's and family members who have served to protect us. The above photos are only a few in our family, there are many more that I hope one day to have photos of and more information about their lives. My grandfather: Adalbert Haf, 1907 ~ 1968, he did not serve in the U.S. but he served in the German Mtn. Rangers and was shot in the arm/shoulder during WWII. He loved serving. Also in the photos with my grandfather is my Aunt Inge (the mother of my cousin Pete Kaps in photo to the right) and my Oma, Lieselotte Haf 1913 ~ 2010. My cousin Pete Kaps (3rd on the right) served in the U.S. Army. Enlisted 28 May 1975, as private E-1. Made E-5 (Sgt) after 2.5 years. Cousin Pete's ETS date was 26 May 1978. He was E-5 (Sgt) when he left the service with an honorable discharge. He was a helicopter crewchief on a UH-1H Huey Helicopter. Pete and I just re-connected after 30 years! Love my cousin Pete! 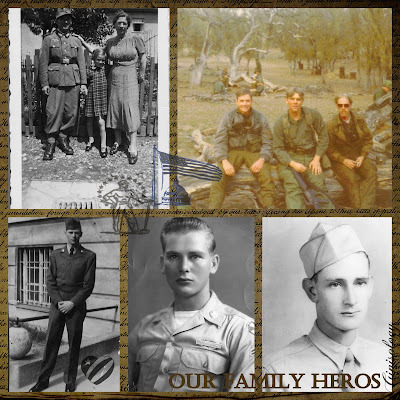 My father, John Adam Eimes 1931 ~ 1997, in the two photos on the bottom to the left, he served in the U.S. Army and was part of the Korean War, also wounded. My Uncle, James Eimes (my father's brother) 1924 ~ 1989, served in the U.S. Army. I loved your posting on Veterans Day and find such entries very moving. I was proud to put on my blog memories and photographs of my grandfather and great uncles who served and died in the First World War.